Brussels Sprouts is something we never had growing up. From the TV programs we watched, it sounded like they were horrible. After getting married, I started trying all sorts of new foods that we didn't have as kids. Brussels Sprouts is one of those and we have enjoyed them ever since! Typically I would roast them with some olive oil, salt and pepper. 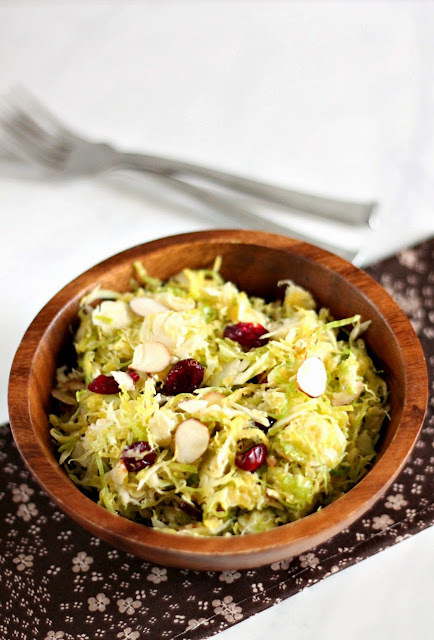 When I came across this recipe it sounded interesting as it uses raw shredded Brussels Sprouts. This salad is very quick to put together if you are using a food processor. I like to let this salad sit for a bit so that the brussels sprouts can absorb all the dressing. I used Coconut Vinegar in this recipe and it worked really well. Coconut Vinegar isn't the easiest to find. I've used Balsamic Vinegar as well with great results. Trim brussels sprouts and cut in half. Using the slicer on a food processor, slice the brussels sprouts. Transfer to a bowl. Lightly toast the almonds in a skillet and set aside. In a small saucepan, add the dressing ingredients and whisk together. Heat until bubbling. Pour over the brussels sprouts and mix. Add the toasted almonds, cranberries and Parmesan and gently stir. I like the salad to sit for a bit before serving so the brussels sprouts absorb the dressing. I hated them as a child. My school in England would boil them and the stench was unbearable! I started buying them again as an adult hoping to change my attitude and now they are some of my family's favourite vegetables. The trick is to cook them correctly!